LISI is committed to ensuring that every employee has access to the training actions necessary to build their career path. 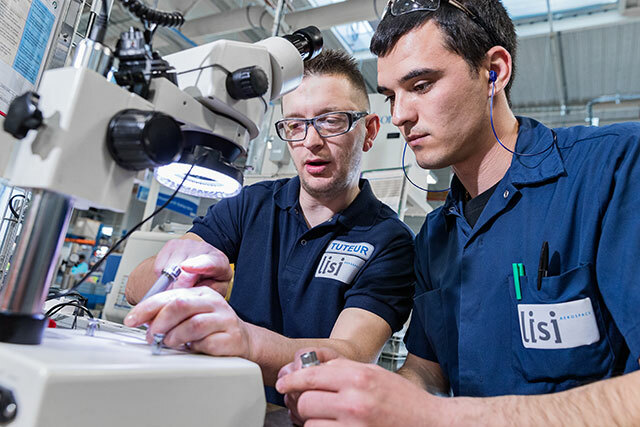 Spread out in 13 countries around the world, LISI Group employees deliver far more than just the products or tasks for which they are responsible. Whatever their duties, they contribute individually to the efforts of a team whose goal is to achieve industrial excellence. This is the reason why LISI attaches particular importance to the integration and training of all its employees, in order to enable everyone to express the best of themselves in this team. This priority has remained central. In 2017, 1,675 men and women joined the group to support its development and contribute to its growth. The acquisition of 51% of the U.S. company Termax, designer and manufacturer of clipped fastener solutions for automotive interior trims, further strengthens the Group's anchorage on the other side of the Atlantic: 19.1% of LISI employees are now based in the United States, Canada and Mexico, compared to 16.8% in 2016. Identifying talent and attracting tomorrow's employees is a crucial competitive issue for all industrial companies. It is a key factor in LISI Group's dynamism in the medium and long term. This is the reason why LISI AEROSPACE deployed its co-optation program in 2017, which allows employees to recommend someone from their network for an open position. This mechanism, which contributes to the recruitment of talents and promotes cohesion, provides a reward paid in the form of bonus if the recruitment is a success. The Group has also developed an original compensation system, which values the company's performance as well as collective and individual achievements. Internal mobility, whether geographical or functional, is also a structuring axis of its human resources policy. The "Job Interchange", accessible on the Group's Intranet, enables all LISI employees to become actors in their own development, for example, by guiding their career path to international trade or to another profession. Training is the other pillar of the HR management within the company. In 2017, Group companies worldwide invested EUR 8.7 million in training. By offering each employee the opportunity to develop their skills, this effort benefits the Group's sustainable growth. Lastly, it makes it possible to address new developments in the businesses and technologies required for its activities. The actions carried out by LISI also concern the continuous improvement programs of the LEAP System (LISI Excellence Achievement Program), which now cover all the functions of the company. Lastly, they are reflected in the training offer made available by the LISI Knowledge Institute (LKI), which is a central component of the Group's international skills development strategy. In 2017, LKI University organized 112 training sessions in various fields (technical & business, personal development, management & leadership), in order to develop employees' skills or offer support for change. A new training program was launched in 2017, namely "Management for Supervisors". Connected to the LEAP culture, this program aims to make learners aware of their supervisory role, to adopt a managerial posture, to improve the delegation of responsibility at the operational level and to acquire appropriate practices. This program is intended to be offered internationally. In 2017, some plants in Morocco and France deployed it. LISI saw the number of its employees grow by 3.2% in 2017.